Earlier this week I had a chance to spend some time with a small group of local pastors, friends from a particular denomination that, like many of our old-line denominations, are struggling with membership decline and controversy due to theological shifts. Yet, these wonderful clergy serve well, gather for reflection and encouragement, and, in many cases, are doing fine jobs of caring for their local congregations and our community. Their good humor and steadfastness always impresses me and that they allowed me to ramble on about new books, stuff I like, things I think they ought to read, is an encouragement. Now if they could just find the time to read the resources I reported on, or get their parishioners reading more. I know they are trying, and I’ll bet you are too…spread the word about BookNotes blog, please, if you think it might be helpful to other readers, or those who ought to be reading. Thanks. Of course, as is often the case, by the time I returned to the store, great new stuff had be delivered by our stalwart UPS and FedEx guys, so when I got back from the gig, book bags and boxes under arm, I found even more stuff I could have told them about. Here are a few I didn’t mention, but should have. The Pastor as Minor Poet: Texts and Subtexts in the Ministerial Life M Craig Barnes (Eerdmans; $18.00.) I loved many of Dr. Barnes’ books, and his last was especially good, on developing a spirituality of homecoming (Searching for Home.) He has been a friend to many Presbyterians (and others) in DC and in his recent position in Pittsburgh. Dr. Barnes is a poet himself, writing with considerable grace and something beyond charm, although charming he is. It is wise and deep, luminous and provocative. Anyone who has paid attention to serious theological literature in our time knows of the seminal role of Walter Brueggemann’s Prophetic Imagination or his homiletics works such as Finally Comes the Poet. Well, finally, the poet has come, and Barnes calls pastor to a poetic ministry, to see themselves as “minor poets” and to help them interpret the text of Scripture and the lives of the congregations, thereby helping them understand their lives as poets of their souls. 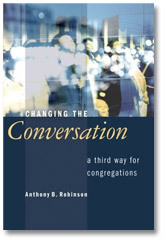 Can faithful words pull this off (I mentioned to the UCC pastors how I like the Lutheran writer Richard Lischer’s remarkable book about preaching called The End of Words which makes this audacious claim.) One good friend, himself a poetry lover, said this was one of the finest books he’s ever read. Highly recommended. 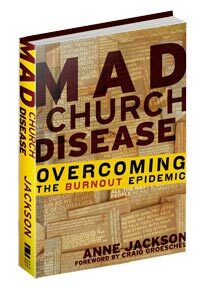 Mad Church Disease: Overcoming the Burnout Epidemic Anne Jackson (Zondervan; $16.99) When organizational guru and best selling hip marketeer Seth Godin blurbs a book about the church, you know it has to be interesting. And this one really is! This play on words is itself pretty funny, but the book is remarkable. Bloggers may know the author’s collaborative FlowerDust.net blog about Christian leadership issues, so she has thought long and hard about this stuff. She is a fine writer, too, clever and punchy and smart. Here’s the starting point of the book: she asks–and tells of her own asking of it—“Does working at this church interfere with your community with Christ?” Whew. That question saved her life and she believes it could save yours too. ecome churches where we help people understand the whole scope of the story of God, and see our lives as a part of that redemptive drama? There is a very, very great introduction by Eugene Peterson and it builds expectation for this wise, passionate and very practical book. Here is his website, with changes to hear him, see other work he does, and learn more. Better, here’s a video clip of Todd talking about the book. The book by Barnes is splendid. Fantastic. Thank you for the kind words on Mad Church Disease! Did anyone have the â€œTitleâ€ â€œpastorâ€ in the Bible? Was anyone ordained a â€œpastorâ€ in the Bible? Any congregations “led” by a â€œpastorâ€ in the Bible? Does anyone have the â€œTitleâ€ Reverend in the Bible? For you have â€œONEâ€ â€œMaster/Leaderâ€ The Christ.